The finest piano lessons in South Kensington can be found at The London Piano Institute. Established by Master Piano Instructor, Celine Gaurier-Joubert in 2011, the Institute offers discerning adults the opportunity to learn with the best. With many years of experience teaching in London, Celine and her team offers piano tuition to all abilities from complete novices to students who are looking to refine their skills. Bespoke lessons are devised for each student to ensure they are guided along their individual journey with personal learning plans created to encourage students to maximise their potential. Piano instruction is offered on an individual basis or for students in South Kensington wishing to learn as part of a team, group piano lessons are also available. 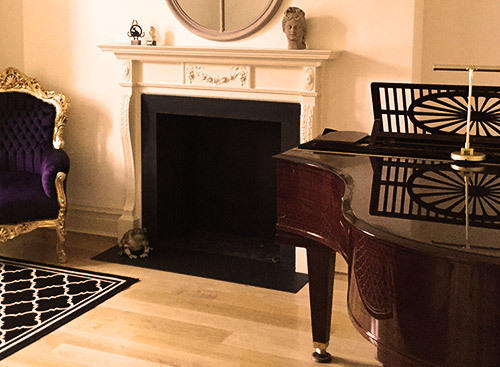 In keeping with Celine’s dream to offer unsurpassed piano tuition, students at The London Piano Institute are privileged to learn on either a Goetze or a Bechstein grand piano in sumptuous studios near South Kensington. The setting has been purposefully designed to enhance the experience for students with beautiful art adorning the walls and stunning views creating the most eminent venue for South Kensington piano lessons. Regardless of age or experience, The London Piano Institute offers beginners the finest start in their journey to become an accomplished pianist. “As a beginner, I didn’t know if I would be able to play the piano. My attitude changed the very first day at the Institute. Celine’s expertise, articulate teaching style and passion for music make her lessons an absolute joy!” Sueli. Students do not need their own piano nor do they need to be able to read music before commencing lessons. The London Piano Institute prides itself on guiding and nurturing complete novices, instilling in them a passion for music that will stay with them for life. The London Piano Institute guarantees that students will make rapid progress within just a few weeks of attending lessons at this prestigious piano academy. Students with many years of experience are very welcome at The London Piano Institute. Master instructor, Celine offers bespoke one-to-one tuition based on her years of experience of learning with some of Europe’s most eminent pianists including Edson Elias, Francois Weigel and Pascal Devoyon, so you can be sure you are really learning from one of the UK’s most sought-after piano teachers. Students are welcome to choose from 30 minute, 60 minute or 90 minute lessons. As well as traditional classical music lessons, the Institute offers Blues, Jazz, Rock and Pop lessons. Prices start from just £175 per month. The London Piano Institute is located near Park Lane, Mayfair, just a few minutes’ drive from South Kensington and is open Monday – Saturday offering lessons in the day and early evening.